(Beyond Pesticides, April 15, 2019) Beyond Pesticides’ 37th National Forum, Organic Strategies for Community Environmental Health: Eliminating pesticides where we live, work, learn, and play, co-convened with the Children’s Environmental Health Center of the Icahn School of Medicine at Mount Sinai, brought together scientists, land and park managers, urban farmers, policy makers, and advocates to chart a course that takes on the big public health and environmental issues associated with chemical-intensive practices. 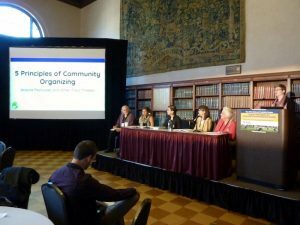 The conference began with a tour of the organically managed Battery Park Conservancy (in lower Manhattan) and the urban farm at Wagner Houses (East Harlem) of the New York City Housing Authority and coordinated by Green City Force. The Forum brought together speakers who addressed the problems associated with pesticides use, cutting edge science, and solutions embodied in organic practices. The speaker line-up brought together leaders in their fields. Joan Dye Gussow, EdD, a leader of the organic and local food movement, kicked off the conference with a talk grounded in a history of pesticide contamination and poisoning issues that helped to launch mainstream organic agriculture, now subject to attacks that are undermining public trust in the standards and the organic label. Dr. Gussow was awarded Beyond Pesticides’ Dragonfly Award, for her “tireless educating and advocating for a society that values a healthy food system and functions in harmony with nature.” Participants heard talks from those meeting the challenges necessary to transform the public’s understanding of: the serious adverse effects of pesticides, including talks on the endocrine disrupting, cancer, and debilitating gut microbiome effects of glyphosate (Roundup); the link between autism and pesticides; approaches to living with spontaneous vegetation in urban areas with a focus on urban ecology; biodiversity and pollinator protection; organic turf and landscape management; urban farming led by New York City youth; pesticides and the law; genetic engineering and the challenges to health and the environment; and many other topics. The Forum featured the New York City premiere of the film Ground War. The film is a moving depiction of a son’s quest for answers about his father’s cancer-which takes him into the world of doctors, scientists, pesticide regulators, victims of pesticide poisoning, activists, and land managers. The film screening was followed by a panel discussion that featured former applicator of Roundup, groundskeeper Dewayne “Lee” Johnson—terminally ill from non Hodgkin lymphoma, but committed to speaking out. Mr. Johnson won a $289 million jury verdict against Monsanto (Bayer) last year. The Forum sessions will be available on video in the near future. 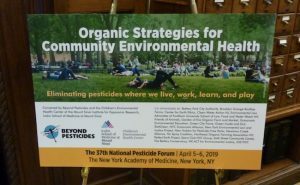 (April 10, 2019) At [the] 37th National Pesticide Forum [April 5-6, 2019] in NYC, doctors presented the latest research on how harmful glyphosate is to the body, lawyers and researchers discussed key matters related to chemicals, and landscapers talked about effective management practices for nurturing soil and plant health. 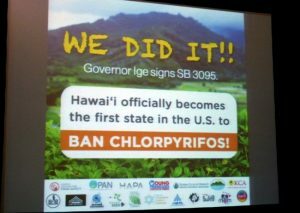 Yet, what may have been the most compelling and inspirational presentations were those by activists from across the U.S. — from Hawaii to Massachusetts and from Colorado to Maryland — who have worked to ban pesticides in their local cities and states. These people realized that because our federal government has put the interests of major chemical companies ahead of human health, there was no choice but to take matters into their own hands. “The aggressive undermining of the laws by the EPA has been an important motivator around the country for citizens to use local authority to protect themselves and their families. 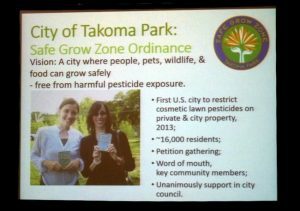 Each group comes at it from a different perspective, whether it is a food safety one or because they are concerned about pesticide use on parks and playgrounds. Yet, they all understand that these chemicals are very dangerous. 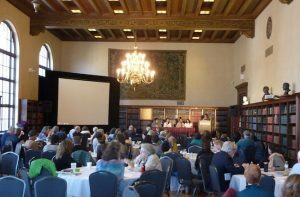 When these folks work with us, they are looking for solutions — ones that work and are effective,” said Jay Feldman, Executive Director of Beyond Pesticides, the organization which hosted and organized the conference. What may not be readily apparent, however, is the critical role that organic standards play in the banning of these chemicals. “In the case of Portland, Maine and Montgomery County, Maryland, we relied on and presented standards in the Organic Foods Production Act of 1990 (OFPA) that are relative to turf and landscape management. It is the only standard in federal law that embraces the precautionary principle and is one that is protective of human health and the ecosystem. Because of OFPA and organic standards, we are able to demonstrate to local municipalities that there is another way, and the fact that these alternatives carry the imprimatur of the federal government is of tremendous consequence,” put forth Jay Feldman. At the National Organic Standards Board (NOSB), the 15-member advisory board that makes recommendations to the USDA about processes and ingredients, any specially approved material is allowed for a five-year period. This gives a farmer or a company time to come up with an alternative or allows the NOSB a period to evaluate new science. As it was originally designed, at the end of the five-year period, that specially approved material “sunsets off” or expires, with a 2/3rds vote of the board needed to extend it for another five years. In September of 2013, the USDA abruptly and unilaterally changed The Sunset Rule without any public input and made it such that a 2/3rds vote of the board is now required to remove an ingredient. As such, having strong organic standards transcends the desire to have a high-integrity, high-quality organic food system. It means something larger. “These local groups are demonstrating that we can eliminate exposure to chemicals that are hazardous to our health, and we are developing an approach to address the climate crisis and the insect apocalypse, both of which are foundational to life,” said Jay Feldman. 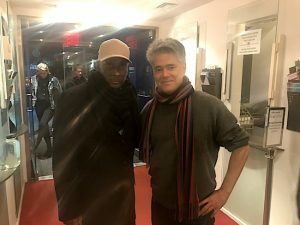 At the movie premiere was Dewayne “Lee” Johnson, the California groundskeeper who sued Monsanto for giving him Non-Hodgkin’s lymphoma and was subsequently awarded $289M. Mr. Johnson made the trip to NYC from California despite the fact that cancer has taken a serious toll on his body, and he is covered in lesions. Needless to say, this man is an unquestioned hero to all of us in the organic community. Click HERE to watch my short interview with him. 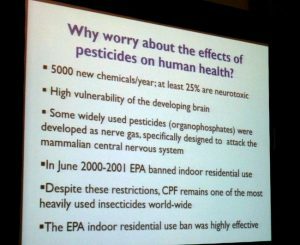 Overall, Beyond Pesticides put on an excellent conference and demonstrated what an important organization it is to our movement. This entry was posted on Monday, April 15th, 2019 at 12:00 am	and is filed under Uncategorized. You can follow any responses to this entry through the RSS 2.0 feed. You can skip to the end and leave a response. Pinging is currently not allowed.